Any of you watch(ed) Dexter? My camera man and I love Dexter, but we only watch it when we get together with my brother and sister in law. We are working on finishing up the last season. We got together this past Friday to make a delicious dinner and of course have a Dexter marathon. chop garlic and mix with mustard. Everyone will use a different amount of mustard. It depends on how big of a fish you have. 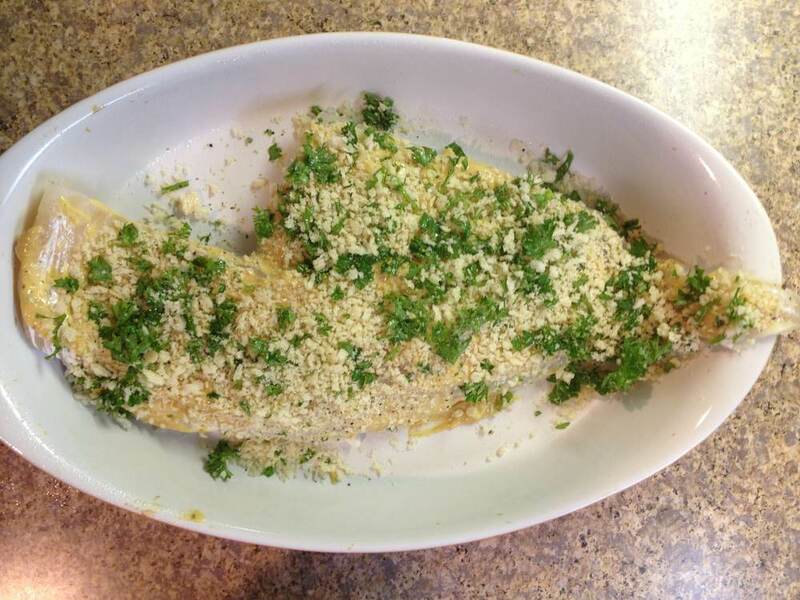 Coat white fish with mustard and garlic, salt and pepper. Chop parsley and mix with panko bread crumbs. You do not need a lot of parsley. Just a little to add some green! Place on top of fish. Add a tiny spray of oil on top of fish after you place your bread crumbs so that they brown and get a little crispy in the oven. Bake haddock for 20 minutes (more or less depedning on thickness). For the last 45 seconds broil fish on HIGH to get the bread crumbs a bit crispy! This dish is easy to make and of course tasty. For a side we had brown rice and baked brussels sprouts! And for dessert some amazing butter-less egg-less pumpkin spice chocolate chip cookies. Will get the recipe!